The selection and monitoring of service providers for your plan such as recordkeeper, administrator, trustee and custodian, along with their respective fees’ reasonableness. The selection and monitoring of brokers, consultants, investment advice service providers, along with monitoring associated fees. The selection and monitoring of investment managers, investment options available in the plan, along with monitoring of investment expenses. Under most retirement plan platforms available in the market today, the trustee does not have discretionary authority over the investment of plan assets. Instead, the trustee is a so-called “directed trustee”, meaning that another fiduciary, such as the employer, has responsibility for directing the trustee as to the investment of plan assets. In such cases, the employer retains the fiduciary responsibility under ERISA for investments. Unlike most pension and 401(k) plans, the trustee of the Program, Mercer Trust Company, has discretionary authority and control over investment responsibility for the Program’s assets. Your only investment fiduciary responsibility is for the selection, and the continued use, of the Program. 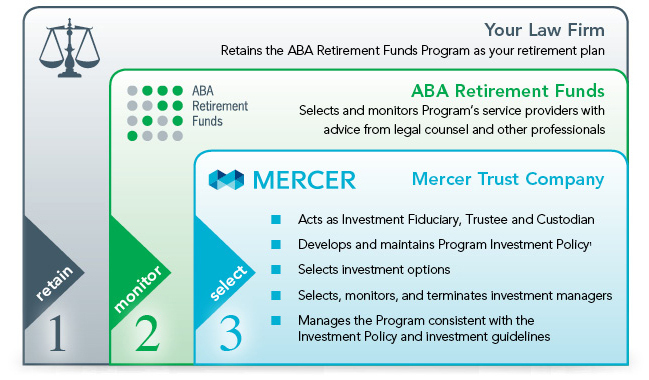 ABA Retirement Funds monitors services provided to your Retirement Plan. Mercer Trust Company has responsibility for development of the Investment Policy for the Collective Trust, subject to acceptance of the ABA Retirement Funds, for implementation of the Policy, and for monitoring of the platform of fund investments and any manager appointed to manage the Funds. Subject to acceptance by ABA Retirement Funds. Feeling Exposed? Take our short quiz to see if your firm is benefiting from maximum fiduciary protection. Learn more about other types of fiduciary services available in the market place and how they compare to the Program’s fiduciary solution. Do you acknowledge your fiduciary protection in your Program Annual Disclosure Document? Why doesn’t the Program offer a certified fiduciary warranty like other providers? We don’t believe it would have any value other than sales promotion. The Program offers the following meaningful documentation to serve as fiduciary authenticity: Program Annual Disclosure Document, Program Investment Policy, Program Report – outlining all of the Program’s oversight annually, and Retirement Plan Library – a binder to house all plan and compliance documentation. What is my fiduciary liability when it comes to the Self-Directed Brokerage Account? Under prior rules, because the Self-Directed Brokerage Account allows plan participants to access a broad range of investment options, in addition to the Program’s designated options, your fiduciary responsibility outlined in section 404(c) of ERISA should be satisfied. To the extent new Department of Labor rules require any additional reporting, the Program will take necessary or appropriate action to facilitate compliance. 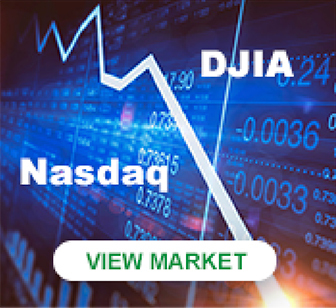 To learn more about fiduciary considerations in offering a brokerage window, click here.